You want to eat a good meal, something that you created yourself that tastes good. That's what this ribeye is going to do for you. This dish is so flavorful it's going to fill up your kitchen with aromas you can only dream of. Let the ribeye sit out for 10-20 minutes to come to room temperature so when it hits the hot pan it starts cooking right away. Preheat a pan on medium-high heat. Bring water to a boil in your steamer. Place another pan on medium heat and add the chopped bacon to cook and render the fat. Rub olive oil on both sides of the ribeye and season with salt and pepper. Place seasoned ribeye in the preheated pan—you should hear a sizzle when the meat hits the hot surface. Cook for 3-5 minutes on each side to desired doneness. Once cooked, remove the pan from heat and allow the ribeye to rest for about 10 minutes. Once the water is boiling, place swiss chard in steamer basket. Cook 1-2 minutes until softened, then remove from heat and drain. 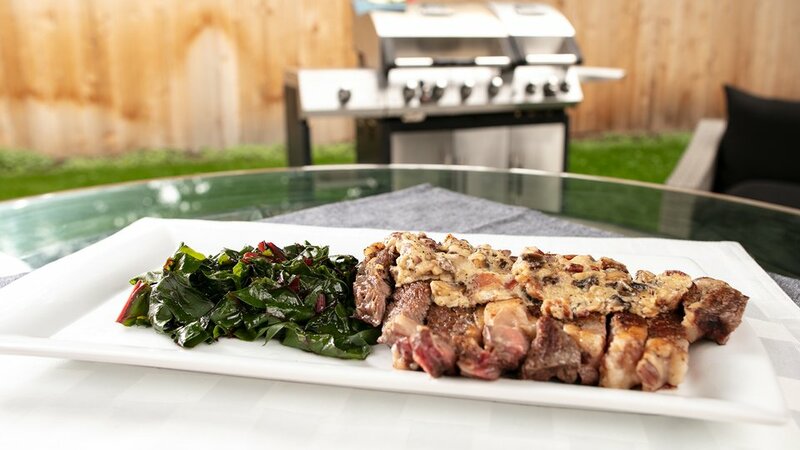 Divide the ribeye and swiss chard between two plates and drizzle with homemade bacon alfredo sauce.